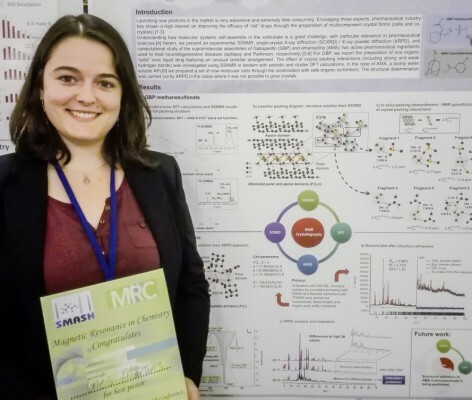 Inês Martins, a PhD student of CICECO-UA and CQE-IST, supervised by Dr. Luís Mafra and Prof. Maria Teresa Duarte received the best poster award at the SMASH conference - an international conference of NMR for small molecules in Baveno, Italy. Sept. 17-20, 2017. The prize has distinguished Inês’s work in combining solid state NMR, X-ray crystallography and computational methods for the structural characterization of new multicomponent drug forms, used to treat neurodegenerative diseases. The poster entitled “Characterization of multicomponent crystal forms of neuroleptic drugs by NMR crystallography” was the best (along with more three posters) among the ~100 presented works. The presented work aimed at the study of the structural and physicochemical properties of Gabapentin and Adamantylamine co-crystals/salts, used to treat Epilepsy and Parkinson disease, respectively. The complementary application of the 3 above-mentioned techniques is a powerful combination to investigate solid drugs whose importance have been recognized by the pharmaceutical industry over the last years.